the occurrence of rare events is statistically random, within the limits of physical possibility. The general rarity of snow in the Nation's Capital doesn't prevent the snow day fanboy population in and around the Beltway from agonizing over the prospects for the white stuff and speculating over when to finally stick a fork in winter and get a life. Generally, this occurs by early June, at which time discussion turns to the outlook for the following winter. Clearly, by late February the average temperature trend has begun to turn upward, but what is the effect on snow chances? 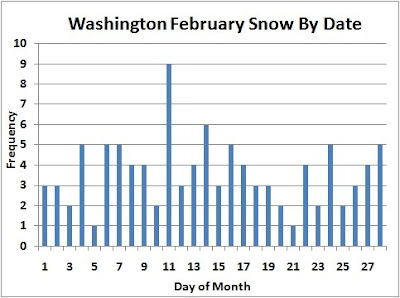 The chart shows the frequency of 1" or more of snow falling on any given date in February over the last nearly 80 years (1930-2007) in Washington. The peak of 9 occurrences occurs near the middle of the month on the 11th, but the preceding and following days have frequencies of 2 and 3, respectively. On the other hand, by the end of the month, snow has been observed 5 times on the 28th, which is 5 times as often as the mere 1.4" which fell on Feb. 21, 1993. In an opinion piece by George Will published on February 15, 2009 in the Washington Post, George Will states "According to the University of Illinois' Arctic Climate Research Center, global sea ice levels now equal those of 1979." We do not know where George Will is getting his information, but our data shows that on February 15, 1979, global sea ice area was 16.79 million sq. km and on February 15, 2009, global sea ice area was 15.45 million sq. km. Therefore, global sea ice levels are 1.34 million sq. km less in February 2009 than in February 1979. This decrease in sea ice area is roughly equal to the area of Texas, California, and Oklahoma combined. It is disturbing that the Washington Post would publish such information without first checking the facts. Fact-checking? We don't need no stinkin' fact-checking! I thank The Post for George F. Will's Feb. 15 op-ed column, "Dark Green Doomsayers." The renowned climate expert put global warming in perspective for me, i.e., Earth is actually getting cooler. So, rid yourself of those high-mileage cars and buy a Hummer or two. Seek opportunities to drive your car needlessly. Ensure that your food is produced at least 2,000 miles away, and bottled water should travel at least 3,000 miles. Keep your house shirt-sleeve warm in the winter and chilly in the summer. Better yet, open the windows. Never again buy any used item. Get rid of those energy-saving but funny-looking light bulbs. Write to your electricity supplier and demand that it power your refrigerator with energy from coal. Promote deforestation. Ignore news stories such as "Scientists: Pace of Climate Change Exceeds Estimates," also in The Post on Feb. 15. God bless Mr. Will for unshackling me from carbon worry. For previous Will-full hot air, see here. Seasonal Update: Near-Average Spring 2009 Forecast for U.S. Images (click to enlarge): Spring (March-April-May) 2009 temperature and precipitation forecasts, 90-day average temperatures and departures ending Feb. 17, from Climate Prediction Center. The seasonal forecast for meteorological spring (March-April-May) 2009 was issued today by the NOAA/NWS Climate Prediction Center. Equal chances of above, near, or below average temperatures are expected across most of the country. The exceptions are the Southwest through the western Gulf Coast, where chances of warmer than average temperatures are up to 50%, and the Pacific Northwest, where cooler than average readings are forecast. States with primarily warm temperatures predicted are: Utah, Colorado, Arizona, New Mexico, Texas, and Oklahoma. Cool temperatures are predicted for the state of Washington, most of Oregon, and northern Idaho. Precipitation is also expected to be near average over a large area, with drier conditions predicted from the Southwest through the Gulf Coast and Southeast. Meanwhile, with 10 days left in winter, temperatures for the last 90 days have been running warmer than average over most of the Southeast and nearly all of the western half of the U.S. Cooler than average temperatures have prevailed over New England, the Mid Atlantic, and the Midwest, as well as central and southern Florida and the extreme Pacific Northwest. So is Gray just another sad example of the distinguished elderly scientist going off the rails and becoming a crank? I think so, but given his career and accomplishments, he deserves at least the respect of a refutation. Meanwhile, the ad hominem hack attacks have already begun. There is a real risk that human-caused climate change will accelerate the release of carbon dioxide from forest and tundra ecosystems, which have been storing a lot of carbon for thousands of years.